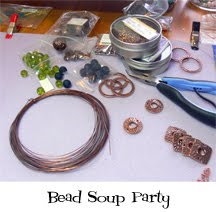 Welcome to the Bead Soup Party, hosted by the lovely and talented Lori Anderson. Click here to go back to Lori's party page to see the list of all the participants! Happy Surfing! My party exchange partner was Maria Grimes of Garden Path Beads. Maria is a lampwork glass artist, that has mastered the fine art of whimsy in her creations. She sent me this sweet set of beads in and bright and colorful red, green and white color palette. Maria made this oxidized silver swirly hook clasp to use in my project. To keep with the colorful theme, I paired these beads with some light aqua resin rounds from Natural Touch Beads. They are strung on wire up around the back of my necklace with small darkened copper metal seed beads. At the front is a strand of large textured oval link chain. I wire wrapped the lampwork beads all along the front and added in a few fairy pewter focals from my friends at Green Girl Studios. I also added a few dyed buri seeds in a lime green, with faceted green Czech glass rondelles. The green and red leaf looks like it was made for this set! It came from Sabine at Little Cup.I placed the clasp at the side, adding to the asymmetrical flair of this garden themed piece. I love the polka dotted theme in the beads that Maria sent. They really add a fun element. Although this color palette is not one that I normally work with, I had fun stretching my abilities and trying to think outside of the box, of my normal earthy tendencies. Thanks for stopping by to check out my Garden Delight necklace. and have fun traveling through the blog party today! I can't wait to see what Maria creates with the fun set of beads I sent her! Lorelei, what a fun piece! Right now I am looking out my front window as I type at a blizzard (our second in 4 days) and then I look at your necklace and don't care! I love polka dots, they just turn everything whimsical and party like! Love your piece! Nice, Lorelei, so summery which is something I definitely needed this time of year! Classic Lorelei with a splash of whimsy! Turned out so sweet. Love that shade of blue too. Thanks for the cup of soup. Like a Spring garden ... which we're all rooting for right about now! I love the beads that Maria sent, but the leaves and all of the silver components that you added made a stunning design. The aqua is a perfect counterbalance to the "heat" of Maria's beads. Beautiful job, L.
This turned out great, I love that the entire piece has remained that whimsical feel that the beads inspired. Your combinations rock!! this is such a fun design. i love how the aqua adds the perfect balance of calm to the collection of art beads. The colors are wonderful and I love the playfulness of the piece. I love this necklace. The lampwork suspended from chain is just fun and PERFECT!! I love GGS charms that you added to it. What a fun necklace!! Beautiful! You've really made her beads sing, Lorelei. What a fun and lpayful piece. LOVE it! The red and aqua are a great springy/summery combo. I adore this fun, fun piece! The assymetrical side and the thick chain with the beads really appeals to me. Looks so very good! Too Much Fun! This is a light and airy piece that had me GIGGLING with JOY! I love pieces that make me feel happy! Fun! That was the first word that came to me when looking at your beautiful creation! Great job! What a great necklace. I love everything about it. Lucky you to get Maria's beads! What a fun and whimsical necklace you created! I'm signing up next year! What a great playful feeling! I was wondering how you were going to use those vibrant glass beads! Great work! What a great necklace I LOVE what you did with your beads and closure - it all came together so well - I am off to see what other's did - such fun for a snowy day. Really cool, whimsical and fun! Whimsical is the word for this lovely necklace! Love it. OMG How pretty is this...I think fun when I see this you did an outstanding job! I absolutely love it! Maria is the best, and I love how your worked it all together! I just got some Buri seeds and they work great with the lampwork! Lorilei, your bead soup necklace is pure delight-you did a wonderful job designing--all the elements came together with perfection! You whimsical gal, you! Those aqua beads were the perfect choice to really make everything just POP! Love it! Wonderful piece! I love how you separated the colorful elements on silver links so that they stand out but don't overwhelm. Awesome! Beautiful! What a fun, happy necklace! Wow, what great colors and a beautiful design! Wish I could wear it! Great design. Maria makes such adorable beads and I really like the funky edge that the oxidized silver adds. I love what you have done with your bead soup. So fun and colorful! love what you did with the mix..the aqua sets off that red beautifully and the chartruese green makes an amazing combo. Love the technique of suspending the glass beads from the link chain. I want to try that one day. Lori, I am always amazed how you can take something like these pretty bright red beads, add even one more color and make it seem so sophisticated and mellow. I love how you toned the colors down and still underlined those pretty beads. Great as always. Very nice piece! Such fun and wonderful colors! Job well done!! first,I have to say I am a HUGE fan & that I was the most curious about what you would do w/ beads that were so different from what you usually use. you did not disappoint! Very fun & whimsical!! Great piece! What a lovely necklace. It is a feast of color and texture. Love those aqua beads and the Maria beads combined. Bravo. pretty pretty!! I usually work with earthy tones as well, love how you successfully thought outside the box with this one to create something so airy and fresh...great job! Lorelei that is just a Lovely creation you did as Always!!! Really Sweet!!! I never would have thought of pairing the aqua with the red and lime green but it looks spectacular. Love the addition of the Green Girl Studios pieces. That just add to the garden feel. I love the necklace, Lorelei, so whimsical! Sometimes you just have listen to the beads! This necklace is so fun and colorful! I like how you dangled the elements so it will have great movement. That is fresh, fun and fabulous. I think that you picked the perfect beads to complement the ingredients you received. I remember that I was really looking forward to seeing what you would do with this...you never disappoint. Thank you for stopping by to taste a bit of my soup. I always appreciate your comments. I love Maria's beads and you did such a perfect job showing them off! The necklace is delightful, love the variety of beads and color. I like your style! Such a fun, bright and cheerful piece of jewellery! Just what I needed to see on such a dull grey day! So sweet and clever. Very girly and summer-like. Yay! That is so pretty! I want to say whimsical. I wouldn't have thought to pair the pale blue with those colors, but I love it. It's a great tie-in. Such a fun and bright combination! I love what you did with your Bead Soup, and you are so lucky to have Maria as your partner :) I would not have thought of the color combination you chose, but it looks great together! Going out of your comfort zone certainly paid off...great job!! That necklace is a lot of fun :) You did a great job with the really cute beads you were sent!